What are the techniques that enable the size of the calves to be increased when the contour is insufficient? There are several aesthetic surgery techniques for calf augmentations: calf implants (prostheses), an injection of fat (lipostructure) and calf augmentation using a Macrolane injection. What are the causes of insufficient calf volume? This calf surgery consists of inserting calf implants. The implants are made of cohesive silicon gel. The scar from calf augmentation surgery with implants is positioned at the posterior surface of the knee (popliteal fossa) and measures 3 to 4 cm. The calf augmentation is performed using an autologous injection of fat, harvested using liposuction during the same surgical procedure. This concerns a graft of fat cells, the uptake of which is 50 to 70%. A second session, 6 months later, may be necessary to obtain the desired result. Mild pain at the liposuction sites (7 to 14 days) No pain in the calves. 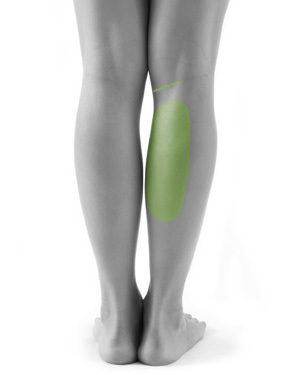 Result of the calf augmentation is immediately visible but over-corrected because uptake of the fat grafting is partial and takes places over 3 to 6 months. The calf augmentation is performed using a Macrolane injection (a highly reticulated form of hyaluronic acid). Macrolane is a resorbable filler product, the injections for which must be repeated once a year on average to maintain the result of the calf augmentation. The resorption of the volume gradually occurs over 12 to 18 months. A further injection, of a lower quantity than the initial volume, is necessary once per year for maintaining the result of the calf augmentation. A calf augmentation using Macrolane injections is always possible, including on very slim patients who do not have a sufficient quantity of fat to perform a calf augmentation using an injection of fat (lipofilling or lipostructure). Macrolane is resorbable unlike lipofilling (injection of fat).